Michelangelo is another nice addition to the Russian Hill area. It is extraordinarily maintained and locals consider it the jewel of the neighborhood. There is a half basketball court, a large tennis backboard to hit on, and a playground with sand area for children. There are benches and picnic tables where you can watch your kids and have lunch. The grass is really nice to sit/lay down on too! 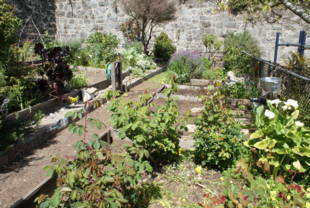 There is also a community garden. 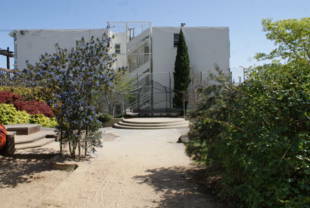 More information, including plot availability, is located on the Recreation and Parks Department Urban Agriculture website. 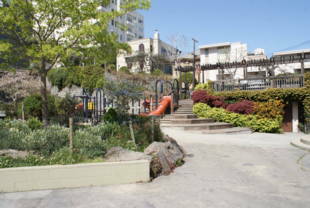 Michelangelo Playground is owned by the San Francisco Recreation and Park Department. 41-Union or 45-Union/Stockton -- Union and Jones Streets, walk north on Jones two blocks to Greenwich, then west (left) on Greenwich to the park. The first block on Jones, between Union and Filbert, is sharply downhill. The short walk along Greenwich from Jones to the park is also uphill, though not as steep a grade as the first hill. Be prepared to hike up that big hill on your return trip along Jones to Union. 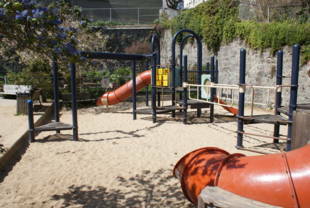 If you wish to avoid the climb, walk along Greenwich towards Coit Tower, and catch a 30-Stockton bus at Columbus and Mason (at Joe DiMaggio Playground/North Beach Pool). Or, if you need to catch the 41 or 45 bus, you can walk down Columbus to Washington Square Park (Columbus/Powell/Union) and catch those buses there.